There is a bizarre case out of Tampa where Candace Patricia Hauser is facing one charge of aggravated cruelty to animals . 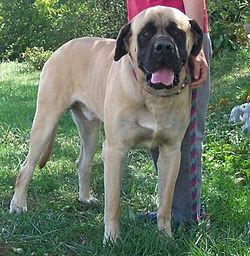 Brenda Hines, 31, brought her Mastiff, Nadia, to Hauser’s house to see if she could help deliver puppies. Nadia was able to delivered (with help) the first 12 puppies but had trouble on the last two. Hauser proceeded to do a canine Caesarian and cut open Nadia to deliver the final two puppies. She then used standard, non-surgical glue to close the wound. This was all done without anesthesia and Nadia died. Hines reportedly pulled out 12 puppies by hand when the dog could not push them out and then cut open the dog open for the remaining puppies. Notably, Nadia was described to police as being in declining health. Hines brought Nadia to an animal hospital to say that she was afraid that Nadia was dying. The veterinarian told her that she had already died. Putting aside the anesthesia issues, the case could raise some interesting questions. First there is the fact that home deliveries are lawful and Hines brought Nadia to Hauser. She presumably knew consent — expressly or implicitly — to the C-section decision. Second there is the proximate cause issue. In a home delivery by non-veterarians, would Nadia have likely died from the breach birth or complications even without the C-Section? Would a doctor have performed a C-section under such circumstances? Hauser was apparently not holding herself out as a doctor but responding to an emergency by a neighbor. Yet, even when someone fraudulently purports to be a doctor, they can be found not liable in a civil proceeding if their actions met the standard for a professional. What would happen if the defense could present a doctor who testifies that he would have taken the same measures to save the two lives while hoping to save the life of the mother? The charges notably do not include any fraudulent claims. The question is whether the charge is based on the C-section or just the lack of anesthesia or both? The latter is clearly horrific and cruel. However, it will be interesting to see how the court defines the range of options for an owner in dealing with a breached birth. She is facing a third-degree felony charge of aggravated cruelty to animals which carried a maximum of five years behind bars and the lost right to own animals in Hillsborough County. This woman, Brenda Hines- owner of dog, went to a veterinary hospital in Lake Alfred twice before this was done. She wanted a C-Section both times, but was refused by vets, being told that this dog was not ready for delivery. Seems to me she was money hungry for puppy deposits and determined to have a C-Section performed regardless. Brenda Hines needs to be charged as well as Candice Hauser! If the dog had gone into labor and was in trouble, any person in their right mind would have loaded the dog up and headed directly to an Emergency Vet! There is NO excuse for this crime. Brenda Hines has been breeding and delivering puppies for a long time, greed got the best of her! mastiff puppies can sell for north of $1000/each. At those prices, I would have a vet on call to take care of the dam and her puppies. Most dog breeders I have met are usually dumb as a doorpost and toothless, so what do you expect? Breeding dogs seems to attract those who wish to make up for their own breeding or lack thereof. It seems to me that some people are treating the value of the life of the dog the same as that of a human being. Animal cruelty laws were not created with this kind of situation in mind. Florida Statute 828.27 defines cruelty as “any act of neglect, torture, or torment that causes unjustifiable pain or suffering of an animal.” This situation does not fall under this definition. Hauser did not torture or torment the dog, nor can any kind of neglect be seen here. I see no crime here. There is no obligation upon a person to seek the help of a veterinarian in this situation, so the owner is not to be faulted either. Does “stand your ground law” work in this case?j/k I feel sorry for the midwife. The owner is culpable in my opinion. Any _good_ reason why the owner didn’t take the dog straight to the vet when problems developed? If she consented, then I’d say both women deserve the punishment. 14 pups… no vet in sight. … So was the octomom. Any bets about jail time for any of these criminals? To me the act if proven would constitute a felony animal cruelty violation. I tried to look at this from the defense of necessity to save the quick dogs but I did not see a statutory provision for this. Is ths stupid day or what….. Unless there was bleeding, there was plenty of time to take the mother dog to the vet for the last two pups. The puppies might have suffered. I suspect they were more concerned about the monetary value of the puppies. This is not uncommon with bulldogs that have a near impossible normal delivery. They butcher the mother to get the pups. The owner, Hines, is much more culpable here than Hauser. If she wasn’t a veterinarian, why would she even have anesthesia available? That would be illegal. She was in a damned if you do, damned if you don’t situation. fourteen puppies in one litter? And had Hines taken the Mastiff to a vet in the first place, all the puppies and the mother might have survived! That’s called owner responsibility. And had she stopped to obtained anesthesia, the Mastiff and two of her puppies would have died. Sometimes you just cannot win. Jon, please defend this Good Samaritan humanitarian from these idiot police!